For other uses, see Beas (disambiguation). The Beas River also known as the Biás or Bias, (Sanskrit, Vipasa; Greek, Hyphasis), is a river in north India. 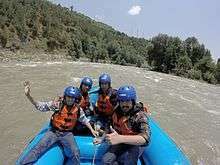 The river rises in the Himalayas in central Himachal Pradesh, India, and flows for some 470 kilometres (290 mi) to the Sutlej River in the Indian state of Punjab. Its total length is 470 kilometres (290 mi) and its drainage basin is 20,303 square kilometres (7,839 sq mi) large. The river was also known as Arjikuja of the Vedas, or Vipasa to the ancient Indians, and the Hyphasis to the Ancient Greeks. 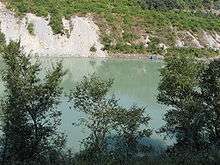 It is said that Beas is a misnomer for Vyasa (exchange of B with V and always truncation of the last vowel is common in North Indian languages) and is named after Veda Vyasa, the presiding patron of the river; he is said to have created it from its source lake, the Vyas Kund. The Beas River marks the eastern-most border of Alexander the Great's conquests in 326 BC. It was one of the rivers which created problems in Alexander's invasion of India. His troops mutinied here in 326 BCE, refusing to go any further; they had been away from home for eight years. Alexander shut himself in his tent for three days, but when his men did not change their desires he gave in, raising twelve colossal altars to mark the limit and glory of his expedition. According to the Kavyamimansa  of Rajasekhara, the kingdom-territories of the Gurjara-Pratihara monarch Mahipala I extended as far as the upper course of the river Beas in the north-west. In the 20th century, the river was developed under the Beas Project for irrigation and hydroelectric power generation purposes. The second-phase Pong Dam was completed in 1974 followed by the first-phase 140 kilometres (87 mi) upstream, Pandoh Dam in 1977. The Pong Dam served initially to primarily provide irrigation below Talwara but was soon developed as well for power generation; its power station has a 360 MW installed capacity. The Pandoh Dam diverts the river through a system of tunnels and channels to the 990 MW Dehar Power Station on the Sutlej River, connecting both rivers. The river rises 4,361 metres (14,308 ft) above sea-level on the southern face of Rohtang Pass in Kullu. It traverses the Mandi District and enters the Kangra District at Sandhol, 590 metres (1,940 ft) above sea-level. During its lower course the Beas is crossed by numerous ferries, many of which consist of inflated skins (darais). Near Reh in Kangra District it divides into three channels, which reunite after passing Mirthal, 300 metres (980 ft) above sea-level. 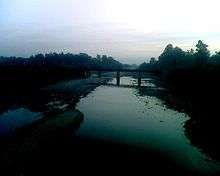 On meeting the Sivalik Hills in Hoshiarpur, the river sweeps sharply northward, forming the boundary with Kangra District. Then bending round the base of the Sivalik Hills, it takes the southerly direction, separating the districts of Gurdaspur and Hoshiapur. 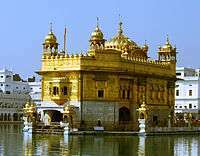 After touching the Jullundur district for a short distance, the river forms the boundary between Amritsar and Kapurthala. Finally the Beas joins the river Sutlej at the south-western boundary of Kapurthala district of Punjab after a total course of 470 kilometres (290 mi). The chief tributaries are Bain, Banganga, Luni and Uhal. The Sutlej continues into Pakistani Punjab and joins the Chenab River at Uch near Bahawalpur to form the Panjnad River; the latter in turn joins the Indus River at Mithankot. 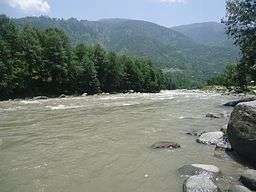 The water of the Beas river is allocated to India under the terms of the Indus Waters Treaty between India and Pakistan. On 8 June 2014, 24 engineering students, and one tour operator, were drowned when the flood gates of the Larji dam were opened, allegedly without proper warnings and procedure. The water level rose suddenly to 5 to 6 feet (1.5 to 1.8 m), and the surge carried the students away. ↑ The Panjab, North-West Frontier Province and Kashmir. Sir James McCrone Douie. 1916, pp. 16-17, 22, 25-26, 52, 68, etc. ↑ Jain, Sharad K.; Agarwal, Pushpendra K.; Singh, Vijay P. (5 March 2007). Hydrology and water resources of India. Springer. p. 481. ISBN 978-1-4020-5179-1. Retrieved 15 May 2011. ↑ Beas The Imperial Gazetteer of India, v. 7, p. 138..
↑ Wasini Pandey, Bindhy. Geoenvironmental hazards in Himalaya. Pg.58. Retrieved 2009-05-29. ↑ "The Empire and Expeditions of Alexander the Great". World Digital Library. 1833. Retrieved 2013-07-26. ↑ Rama Shankar Tripathi (1989). History of Kanauj: To the Moslem Conquest. Motilal Banarsidass Publ. pp. 262–264. ISBN 812080404X, ISBN 978-81-208-0404-3. ↑ "Developmental History of Beas Project". Bhakra Beas Management Board. Retrieved 27 November 2011. ↑ "India: National Register of Large Dams 2009" (PDF). Central Water Commission. Archived from the original (PDF) on 21 July 2011. Retrieved 22 November 2011. 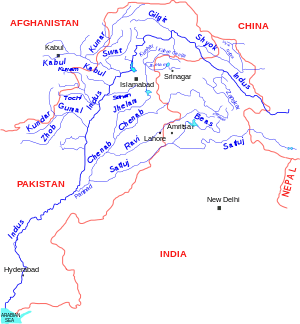 ↑ "The Indus Waters Treaty 1960" (PDF). World Bank. Retrieved 26 September 2016. Wikimedia Commons has media related to Beas River.